Anyone can be cool, but awesome takes practice. And Scott Stratten has perfected this art awesomely. Scott Stratten is my favorite marketing/social media expert ever! Mega Twitter guy, Scott is just real. He’s awesome. He talks in awesome. He just makes sense. Oh, and he’s pretty darn funny! Follow him at @unmarketing. This week, I had the pleasure of meeting Scott in person! I attended his Awesome Book Tour via the Linked Orange County group. Event was hosted by Bryan Elliott at Concordia University in Irvine, CA. Nobody cares about your logo. It’s all about the branding behind it. Marketing in not a task. Passion plus knowledge is profit. There’s ROI in the word, AWESOME. When Google Plus came out, people lost their mind. Stay away from Google Plus forever. Google Plus is a layer of all Google’s services, not a social network. LinkedIn is a directory trying to be a social network. If you don’t have time, don’t do social media. No one said you had to. Two groups of people you don’t want to piss of: Geeks and Moms. Pinterest is successful because of passion, not profit. Pinterest is shoes and Ryan Gosling with no shirt on. Awesome customer service in store leads to more sales. @LushCosmetics greets you with a BIG hello & gives you a personal tour. Insta-sales. Scott tweeted about his brother’s bad phone service, @VirginMobileCan replied with: Your li’l bro should switch to virgin mobile. just sayin’. Boy lost his stuffed toy during travel. @RitzCarlton took photos of stuffed “Joshie” on vacation at the Ritz. Mailed them home with Joshie. Key to business happiness = good happy customer service. When you find the right type of person, you bring in the right type if person. Relationship with clients is like dating. We need to remarry our customers. Make the content good enough so that the third circle (of people) wants to share it. People are not overhead. They are your company. They are your marketers. If you automate, you lose your chance to be awesome. Kitchenaid’s #nbcpolitics tweet was a hiring issue, not a social media issue. Think about where you are putting a QR Code. Don’t put it in a subway, on a bus or in the sky. People can’t scan that! Stop It! Don’t have your QR Code link to a video that can’t be viewed on a mobile device. Stop It! Until we have an auto-prompt when camera sees a QR Code, the mass public won’t adopt to QR Codes. Third book has potential to be called, ‘Stop it!’ Inspired by bad use of QR Codes. 75% of @unmarketing tweets are replies. Pinterest is 97% women & Scott. Scott is not a fan of Google Plus. @MensHumor tweeted this: This morning I gave birth to a food baby and I think @tacobell is the father. 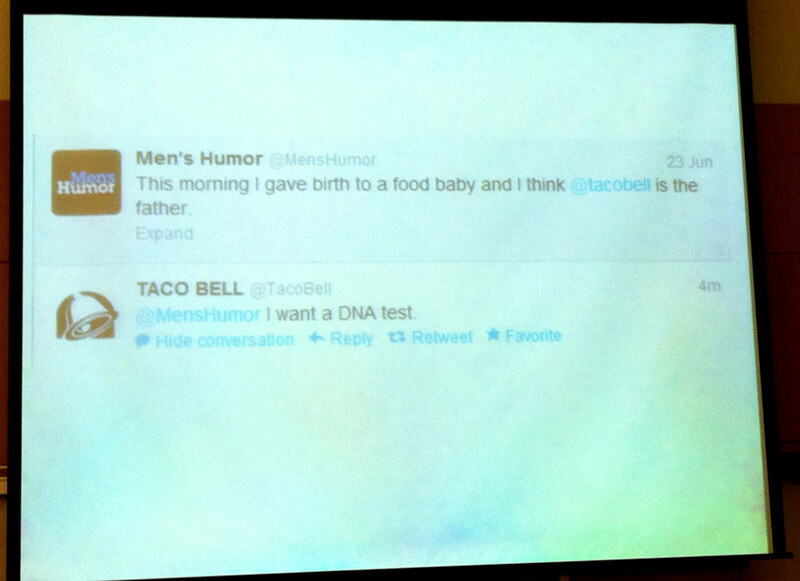 @tacobell responded: @MensHumor I want a DNA test. The Book of Business Awesome / The Book of Business UnAwesome is a flip book. I started reading the Business Awesome side first. Scott says his favorite side is the Business UnAwesome side. Nonetheless, the whole book is awesome. Why thank-ya! Was great meeting you!! Thank you, Scott! So great meeting you! Hope to see you again next time you’re in town. Would love to have you speak at a Social Media Club Los Angeles event too. I’ll keep in touch.